The long-awaited sunshine is headed our way, the children only have weeks left until they break up for the summer so it’s time to start planning how you are going to make the most of the summer this year. One great way to do this is with a Merlin Annual Pass! Plus with the Merlin Annual Pass Summer Sale on until 1st June 2015 now is the best time to buy! We’ve had our Merlin annual Passes for a couple of months and have already saved ourselves money on what we would have spent on normal entry fees. 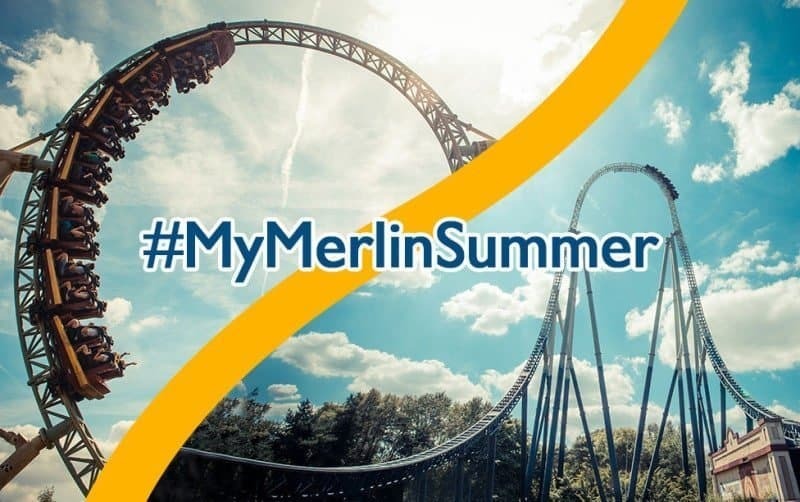 A Merlin Annual Pass lets you access 31 Merlin Worlds across the UK, from the best theme parks – Alton Towers Resort, Chessington World of Adventures Resort, LEGOLAND® Windsor Resort and THORPE PARK Resort. To top London attractions such as Madame Tussauds, London Dungeon, the London Eye and the London Aquarium! It also includes access to 11 SEA LIFE centres across the country, plus landmarks such as the Blackpool Tower. The Merlin Annual Pass Summer Sale ends on 1 June 2015! To celebrate the sale, I’m offering one lucky winner the chance to win a Standard Merlin Annual Pass. My son loves Lego so we would head to LegoLand first as we have never been there before. Gosh with 31 attractions it would be difficult to choose, Legoland does sound great, the Sealife centre would be fantastic and a trip to London would be awesome to Madam Tussauds etc. I think Lydia, Dominic and Seb would love Legoland and we would probably try and go to Thorpe Park too and make a short break out of it, wow that would be fantastic! We would visit Chessington first, we haven’t been in a couple of years and definitely want to return. I’d definitely make Alton Towers my first stop as there is so much to do and see for all ages. The kids are all older and taller now so they would definitely be able to take full advantage of all the thrill rides alton towers has to offer! Chessington would be first, as we’ve never been. Thorpe Park haven’t been there for years! definitely legoland. my 3 boys would love it there. i would go to Alton towers! Would love to take my son and husband to Legoland. Alton towers – one of those places we’ve always meant to organise but never got round to going! Warwick Castle is an amazing day out for all the family. Alton Towers is always the best!! Legoland would be the first place I visit. I would take my youngest to visit the penguins at the sealife centre in Birmingham! I would visit Chessington World of Adventures. Probably Legoland. We went a couple of years ago but there was a crash (no one hurt) that blocked the road for almost 4 hours so we never got into the park till after 1pm after leaving home at 6.00am! So would like to try again. Sea Life Centre Birmingham to see the penguins! I’d go to Blackpool tower! I would visit THORPE PARK! I would visit alton towers. Thorpe Park would be my first! CHESSINGTON ZOO!!! LOVE THE ANIMALS AND THE THEME PARK FUN! LegoLand – my son is dying to go there! Legoland for us… small boy is desperate to go! Cbeebies land at Alton Towers, would love to take my girls. I would go straight to the London Dungeons! I have never been and am studying history so would be incredible 😀 plus the boy I babysit has a merlin pass so I could take him to so many incredible things. I would definitely win best babysitter award. I’d visit the Sea Life Centre at Manchester Trafford centre first! I love Sea Life and I’ve not seen this one as it opened 2 days after my last pass expired! It would be taking the kids to Legoland for me! Chessington World of Adventures would be my first visit; it’s amazing! I’d visit Thorpe Park first! Alton Towers … I haven’t been for years! Thorpe Park first for me please. Thorpe Park! My 9 year old loves it! I would go to Warwick Castle! Thorpe Park would be my first visit. Alton Towers first, Legoland a close second and then Thorpe Park….fun, fun, fun! I would go to Thorpe Park! Love it there! i would like to take the kids to Legoland. Thorpe park resort would be my first port of call.. went there when the kids were little. Alton Towers…. not been in ages. would be giving this to my niece to enjoy with her littleones! Definitely Alton Towers! I haven’t been in years and I love theme parks and rollercoasters. I’d go to alton towers first as I’ve not been for years and it’s always a good day out. Sealife Centre! Both mine loved it when they went last year. Chessington would be my first choice. I would love to go to Legoland. alton towers as it’s not very far away! I’d go to Legoland Windsor. We don’t live far from it now, and I’ve never been there. I would use for my son…he is almost at the paying age and we have passes for the rest of the family already. Madame Tussaud’s! I’ve never been!! I would go to the Blackpool tower. I’ve been in Blackpool this year and it was great. I can’t wait to visit it again. alton towers, i haven’t been in years! Alton Towers – it’s great! Would have to be Legoland. Our DD just loves Lego friends & would love to go. Alton Towers looks amazing, I’d love to go as I’ve never been before. Legoland Windsor would be top of outlet list! I would definitely go to Alton Towers! I would love to go to the London Dungeons! Legoland – my kids love it there. I would love to take my daughter to Legoland if we won! I’d go to Alton Towers! Love it! Oh very nice – my three would all love to go anywhere! Alton Towers for the first time please! I would like to visit Alton Towers. Would love to go to Legoland! Legoland would be a lovely day out! I’d love to go to Alton Towers I haven’t been there for years. I would go to LEGOLAND – I think my daughter would love it. I’d go to Alton Towers. I love it there. I think we’d go to Warwick Castle first, it looks fab. I’d love to visit Alton Towers! Alton Towers – Its my favorite. Legoland for me, I’ve always wanted to go! alton towers for sure, haven’t been for many years! Madame Tussauds – it’s great fun! I would go to Legoland. I’d visit Alton Towers. It is our family’s favourite place in the world. Legoland, or I would never hear the end of it! I want to go visit the London Aquarium! Legoland WIndsor – on a hot summers day! I’m long overdue a return to Alton Towers! The London Aquarium as it’s nearest to us, then we would plan a big day out at Legoland as my kids have wanted to go there for years. I would go and enjoy myself at Thorpe Park First. Legoland we love it there!! Legoland with our 5 year old who is Lego obsessed!!! I would definitely visit Alton Towers first! London aquarium as my little girl loves fishes! Thorpe Park as it has a great mixed range of rides. I would love to visit Blackpool Tower & Madame Tussauds . I’d go to Legoland Windsor! It would have to be Legoland Windsor as my little girl is totally obsessed with all things Lego! Me and the kids would definately visit Legoland first! We would all love to go to a Sea Life Centre. Lots to talk about! LEGOLAND my son Max would love to go. I’d visit the London Eye, London Aquarium & Madame Tussaud’s first. I’m taking my gorgeous girlfriend to see the Foo Fighters at Wembley Stadium in mid-June. If I won this pass, we’d visit all of these attractions while we’re in the neighbourhood! We love Alton Towers, so we would revisit. I would visit Legoland as my son really wants to go there! I’d visit the London Dungeons with my boyfriend – we had our first date there! Legolamd would b my first visit and something to build on! I am actually taking my daughter to Legoland on 1st June as she has an inset day but if I won this competition, my next trip would be to Thorpe Park. CBeebies Land at Alton Towers! Alton Towers Resort, love all the rollercoasters! Legoland!! My boys would LOVE to go there! Madame Tussauds especially to see the new star wars wax models! I think it would have to be Weymouth sea life centre as its somewhere the kids want to visit this summer! Alton Towers, went for the first time last year and my son loved Cbeebies Land! I would love to return to Alton Towers for Cbeebies land. Went last summer for our holiday and my 4 year old son came down with chicken pox. Be great to go again and enjoy and not have to cut it short again.